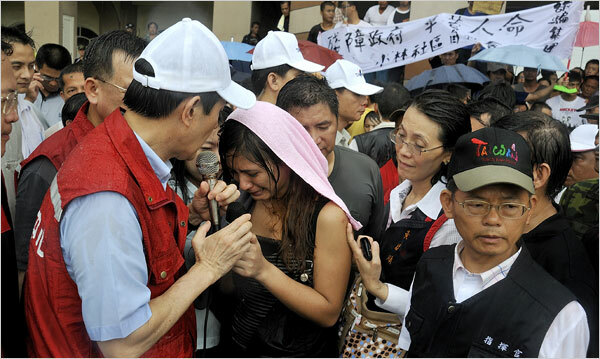 Aijo Wu, center, whose family is missing after a storm, sought help from President Ma Ying-jeou of Taiwan on Wednesday. The moment he stepped onto a soccer field that had been doubling as a landing pad for rescue helicopters, Mr. Ma was besieged by angry villagers who accused his administration of moving too slowly to help those still trapped in the mountains near here. As they hurled insults at him, the skies opened and Mr. Ma quickly became drenched to the skin, all of it captured live on television. Chen Tai-sheng, who trudged out from his mud-soaked village two days ago, said the president should spend less time touring the country and more time orchestrating rescue efforts. “This is a war, not a political campaign,” Mr. Chen yelled. Typhoon Morakot, one of the worst natural disasters to hit Taiwan in 50 years, is also turning into an unpleasant political experience for Mr. Ma, the former mayor of Taipei who was elected last year by a respectable margin but whose popularity has been steadily dropping. The storm, which killed at least 67 people across Taiwan and left scores missing, has turned into the kind of test that can make or break a political career, or in the case of Mr. Ma, provide fodder to the opposition — and irresistible images to a voracious press. On Monday, during an earlier tour of his waterlogged nation, Mr. Ma was seen promising a bulldozer to a man who was searching for the body of his father. Two days later, after failing to persuade officials to make good on the pledge, the man, Lee Yu-ying, was forced to rent his own equipment to dig out his father’s mud-encased car. “What kind of help was that?” Mr. Lee asked TVBS, a cable news channel. As with most natural disasters, there has been plenty of blame to go around. When the extent of the storm’s wrath became clear on Sunday, Mr. Ma criticized the country’s water resources agency for ineptitude and accused the national weather bureau of failing to predict rainfall that soaked some parts of the country for three or more days. On Tuesday, the president of the government’s investigative arm, the Control Yuan, said he would look into whether agencies or officials had a role in the extent of devastation. “If no corrective measures are taken we will impeach them, impeach them and impeach them until they do what we want them to do,” said Wang Chien-hsuan, the agency’s president. Most everyone here has been stunned by the ferocity of the typhoon, which dumped more than 80 inches of water in some places, swelling rivers that washed away bridges and spurring landslides that buried entire villages. A weekend of typhoons claimed two dozen lives in eastern China, Japan and the Philippines, but Morakot had its deadliest impact on the isolated hamlets that dot the mountains of southern Taiwan. Rescue officials, cut off from dozens of communities, have been unable to estimate the number of the dead or missing. Residents who have made it out alive, however, suggest that the figures could be well into the hundreds. Li Jing-rong, 50, a farmer from Hsiao-lin, a village of 1,300 set deep within the craggy folds of Kaohsiung County, said the most densely settled part of town was erased by a wall of rock and dirt that narrowly missed his home. “No one could have survived that,” he said. He said that at least 600 people, including his parents, were swept away around 6 a.m. on Sunday. The survivors from his end of the village, about 40 people, scurried to an open area and then spent three days waiting in the rain before helicopters arrived on Tuesday. He said a separate group of 30, including his brother, were waiting for help in another valley. “I wish the government would work faster because they have nothing to eat,” he said after confronting the president. Throughout the day, as sunshine alternated with soaking downpours, helicopters thundered in and out of Chishan Middle School’s sports field. During the morning, the helicopters picked up supplies. By afternoon, they were returning with muddied and barefoot villagers from a town called Minzu. They were for the most part the dark-skinned citizens of Taiwan known as aborigines, the indigenous mountain-dwellers who have sometimes had an uneasy relationship with the island’s more recently arrived Han Chinese ruling class. As the survivors scurried across the grass, rotors whirling above their heads, a crowd of people, some weeping and wailing, surged forward to meet loved ones, or to ask about those still unaccounted for. “Have you seen my mother?” one woman screamed again and again. No one responded. The injured were bundled into ambulances; taxis and minivans took away everyone else. During the quiet between the arrival and departure of each helicopter, people worried aloud about the unrelenting rain or complained that too many boxes of instant noodles were being delivered to those huddling outdoors without access to water or stoves. Aijo Wu, a 23-year-old law student who has had no word from her extended family in the village of Taoyuan, was the last person to talk to Mr. Ma before his security detail whisked him away. She begged him to speed up the pace of the rescue efforts, but after he left she was less timid in her comments to reporters.